Atmosphere is proud to have built one of the best resort developments in the Philippines (see awards section). 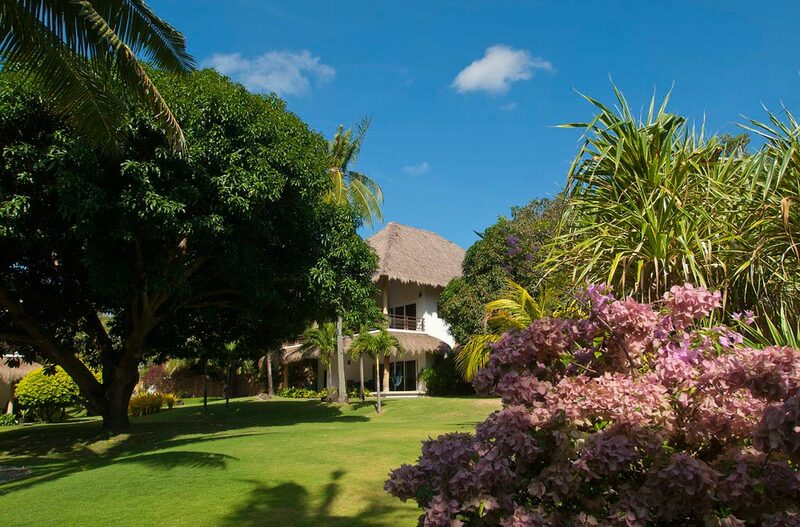 This is a unique opportunity to invest in a second home in our tropical paradise setting. You can enjoy the facilities of a luxury boutique resort, all whilst having the peace of mind that everything from management to maintenance is taken care of for you. All twelve residences (four penthouses and eight garden apartments) sold out pre-opening of the resort back in 2008. From time to time residences become available for purchase as the current owners re-sell. Our ‘residences’ are each made up of two garden apartments on the ground floor, with a penthouse spanning the entire upper floor. Our penthouses are 220m²²of sheer luxury, with open plan fully fitted kitchen, lounge and dining areas, two large bedrooms with en-suite bathrooms, and balconies facing the beautiful gardens or ocean. The garden apartments have a separate master bedroom, a large indoor/outdoor bathroom with his and hers sinks, a walk-in wardrobe, a spacious lounge and fully fitted kitchen, and a terrace. The interiors are contemporary, light and airy, blending seamlessly with the luxury outdoor tropical gardens by way of sliding glass partitions, spacious terraces and lounging decks. 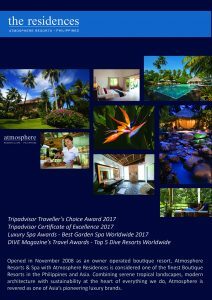 Atmosphere was awarded ‘Top 20 Resort Property 2011’ by the leading luxury real estate publication, Property Report South East Asia Magazine. We were the only property in the Philippines to make it onto this prestigious list of the best private residences available to investors, from beachside luxury to countryside retreats. The residences use a pooled occupancy method, meaning that calculations are based on the total rental income of all apartments during a given period. This guarantees a proportionate share for each unique apartment owner, not counting the days when their unit is with or without occupancy. An owner is automatically exempt from the rental pool at the select time of his/her use, or if the apartment is requested to remain empty. It is a win-win strategy for all apartment owners and ensures fair profitability sharing. For further information on the residences at Atmosphere, please email residences@atmosphereresorts.com.